The Science-Engineering Working Group's proposal to modify the Institute requirements to include a two-semester sequence of subjects in chemistry-materials-biology will be presented to the faculty on Feb. 15, according to Dean for Undergraduate Education Margaret L. A. MacVicar '65. The proposal is contained in a report that was recently released along with two others by MacVicar's office. 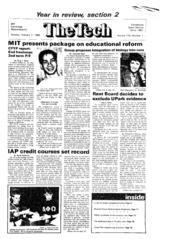 The reports are to be the foundation upon which efforts to reform MIT's undergraduate education will be based this term. The other two reports are The Report of the Committee on the First-Year Program and the report of an ad hoc committee of the Student Committee on Educational Policy. Parts of the SEWG and CFYP reports will likely be voted on at the April 19 faculty meeting, according to a letter MacVicar sent to all undergraduate students this week. Heading the SEWG report was a proposal that called for the creation of a two-term integrated course which would combine chemistry, materials science, and biology. This two-term course would correspond with the 18.01-18.02 and 8.01-8.02 sequences already an established part of the freshman curriculum. According to the group, the two-term integrated sequence is a necessary core curriculum reform because "in the last 25 years the area of biology has developed to the point where it should be considered as a fundamental part of an undergraduate course focused on science and technology. Additionally, both molecular chemistry and solid state chemistry are considered fundamental." SEWG was formed by Dean of Science Gene M. Brown and Associate Dean of Engineering Jack Kerrebrock and co-chaired by Chemistry Professor Robert J. Silbey and Mechanical Engineering Professor David N. Wormley '62. To accommodate the increase from the current required single term of chemistry to the two-term chemistry-materials-biology sequence, SEWG recommended the reduction of the Institute science distribution requirement from three subjects to two subjects. According to Undergraduate Association President Jonathan Katz '90, some faculty members may be troubled by the SEWG report's wording of the revised science distribution requirements, which is as follows: "it is preferable (though we would not at this point insist) that no more than one science distribution subject out of the two remaining [after the integrated course] be a departmental requirement. This conclusion reflects our desire to encourage diversity, but we also recognize that some well-conceived departmental programs may still need to require two subjects that extend knowledge in science disciplines beyond that in the science core offerings." For those majors such as Course II and Course VI which currently have more than one departmental requirement labeled as a science distribution requirement, if the "preferable" is ever changed to "mandatory," then the integrated sequence would result in an additional requirement for those majors. SEWG also suggested a two-stage plan through which the integrated subject sequence would be introduced into the MIT curriculum. The first stage would consist of the development of a pilot offering of the two-term sequence during the 1989-1990 academic year on an experimental basis. The first term of the sequence would fulfill the Institute chemistry requirement and the second would act as a science distribution subject. If the experiment is successful, then the sequence would be put before the faculty for adoption in the 1991-92 academic year as the recommended way of satisfying the proposed Institute requirement in chemistry, materials and biology. In addition to the integrated sequence, the group advocated the development of a new two-term core physics sequence which would include exposure to basic concepts in atomic and quantum physics. According the SEWG report, this addition to the core physics requirement would "support and strongly complement [our] recommended developments in chemistry-materials-biology." SEWG determined that the content and scope of 18.01 and 18.02 "meet the science core goals to a significant extent" and therefore recommended that they be left unchanged. The Institute laboratory requirement was also judged sufficient by the Committee. The SEWG report will be discussed at the February and March faculty meetings, and is likely to be voted on during the April meeting, according to MacVicar. "Though there may be some reservations voiced by faculty members, I'd be surprised if the SEWG proposal didn't pass the faculty vote," Katz commented.